While traditional assisted living centers focus on keeping seniors physically healthy, Aegis Living commits itself not only to helping those with Alzheimer’s feel safe and comfortable and find meaning in the later years of life but also to improving cognitive function. Aegis communities implement a variety of tactics for enhancing brain function, from mind-healthy diet plans to daily games that stimulate gray matter. Seattle’s Aegis on Madison community even has its own Brain Exercise Center, a space for working out one’s brain much like one would exercise their muscles. How does the Brain Exercise Center work? The aim of the Brain Exercise Center is to keep the mind strong, healthy and sharp. It utilizes advanced technology – software and brain-stimulating programs clinically proven to enhance memory retention in those who stick to the curriculum. As Aegis on Madison’s general manager explained in an interview, it utilized two main elements: Dakim and Saido, both of which have a neuroscience basis. Each aims to increase brain neuroplasticity and the mind’s ability to process new information as well as the speed at which it works. It’s about recall, and though the results have been anecdotal, those who utilize the software on a regular basis seem to maintain their sharpness. The positive effects of the Dakim program have been tested and proven in a clinical setting. 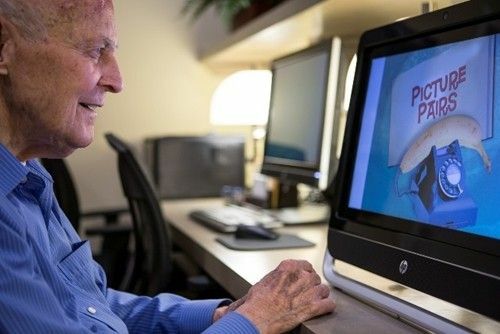 Researchers at the University of California, Los Angeles, School of Medicine conducted a study that looked into how these computerized exercises affect the Alzheimer’s brain. The study involved 84 participants from retirement communities in Southern California, half of which completed 40 sessions of the Dakim training program within a two-month period. The other half was the control group and put on a waiting list to partake in the BrainFitness program. Neuropsychological testing at the end of this period showed that those who engaged in the exercises for two months had significantly improved delayed memory time, immediate memory and language skills. Developed in Japan by the Kumon Institute of Education, Saido is a system of reading, writing and basic math that helps secure “working memory” in the prefrontal cortex. It has been successfully used for more than a dozen years at assisted living communities throughout Japan, working to reverse and slow dementia. It engages participants in simple yet precise exercises that stimulate the frontal lobe and, in effect, improve the learner’s ability to retain new memories. Math: The math problems are generally not harder than a second-grade level, and the focus in not about getting the answer right but rather about going through the mental process of trying to find the solution. When done on a regular and continuous basis, these exercises have yielded excellent results. As far as the math problems go, the act of solving an equation stimulates the memory to recall the proper way to come to the correct answer. The Brain Exercise Center is open to all seniors at Aegis on Madison on a voluntary basis – no one is required to complete the brain-boosting programs. However, the staff at Aegis Living encourage residents to take an active role in maintaining cognitive function and reward those who do: Seniors who complete the brain fitness program receive $50 of Mad Money, a form of currency that residents can use to purchase items at Aegis Living. For example, the Seattle location recently held a live, on-site auction with a real auctioneer, and seniors were able to bid on and purchase items with their Mad Money. At Aegis Living, brain exercise is paramount. The staff work with experienced cognitive health experts to help seniors their gray matter supple, healthy and active. The Brain Exercise Center is a big part of this effort, but there’s much more to the brain fitness initiative. Along with keeping the heart working at top capacity through hydration and healthy eating, these communities encourage other brain-boosting activities, such as social interaction through clubs, hobbies and other personal interests as well as the pursuit of life goals for greater fulfillment and mental stimulation.